One thing I like about Instagram is that I get a lot of recommendations and prompts for different restaurants throughout the metropolitan Chicago area. I am aware that Chicago proper is considerably more culturally diverse than presented via media, but a lot of cultural representation extends to the far suburbs as well. One Nigerian restaurant I have seen posting on Instagram is Bisi African Restaurant. 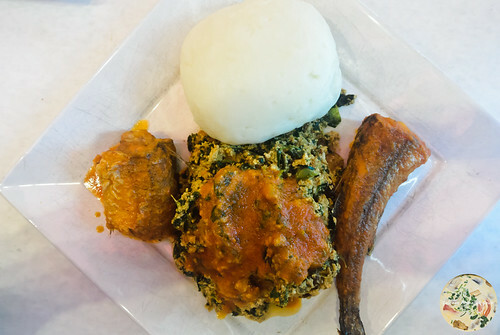 With a location in Schaumburg at 853 S. Roselle Road, I felt I needed to sample from them considering two of my favourite Nigerian restaurants on Chicago’s North Side recently closed their doors. The inside has an open floor plan that eliminates any feeling of being cramped. There are several tables to accommodate parties of four or more and booths that will accommodate up to four in a party. But it’s the food that draws your attention. Since I was going to try two entrées, I started with a suya to whet the palate. This was a platter of skewered steak served with onions, a favourite street food item, all authentic. In addition to the suya, I had moi moi, a rather tasty bean pudding prepared with black-eyed peas, onions, and fresh ground peppers, again all authentic. I have a tickler to myself to have meat pies the next time I return. The server had told me that preparation for the entrées was going to take half an hour and I was okay with that, knowing that nothing was going to be microwaved or warmed up and then sent from the kitchen. True enough, everything was cooked to order. The egusi with fish screamed “just like they eat it in Nigeria.” The melon seeds had been ground up nicely and spiced nicely. The whiting was quite fleshy, yet still had bones in. With fufu in hand, I ate all of it without use of table utensils, and I do mean all of it. The second entrée was a plate of ayamase, my favourite and most addictive Nigerian dish ever. 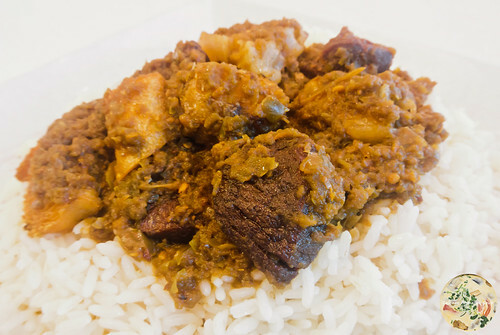 Also referred to as ofada stew, Bisi African Restaurant cooked it spicy, which means they serve it “just like they eat it in Nigeria.” In keeping with being true to the recipe, there were beef, tripe, dry fish, and stock fish in the dish. I recommend this highly. 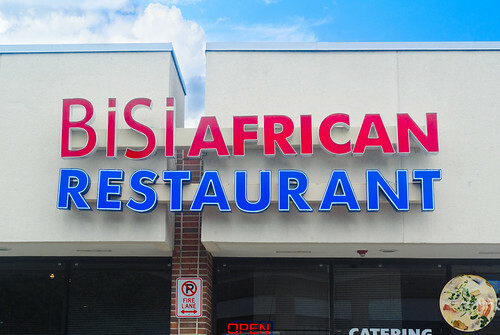 Bisi African Restaurant is a bit of a drive from Chicago. It is worth the trip out to the Northwest Suburbs, though. I can vouch for the food being absolutely lip-smacking, although there are several more menu items that I would love to try. One thing I also like is that the service is outstanding. Granted there was one server working the floor, every table in the restaurant received attention. Good service seems to be a dying trait in the restaurant industry and when you receive top service and see it delivered wholesale to all customers, that makes the dining experience that more enjoyable. I may not make the hour-long drive outside of Chicago, but when I do, it will be back to Bisi African Restaurant. During my university days, my circle of friends became very specific to West Indians and West Africans — Jamaicans, Haitians, Crucians, Ghanaians, Nigerians, Ivorians, and Senagalese. For us, it was customary to have some cultural representation in food available during study sessions that were not conducted in the library or in the labs. We built our networks so solid that whenever we travel the world, we assured each other that we or our families would look out for any in our network when we pass through their countries. When I started traveling between Chicago and Cape Town for personal holiday, I would stop in Dakar for an extended layover and, of course, partake of Senegalese food before my continuation flight. Goree Cuisine at 1126 E. 47th Street takes me back to Dakar where everything is proper Senegalese instead of essence of Senegal. 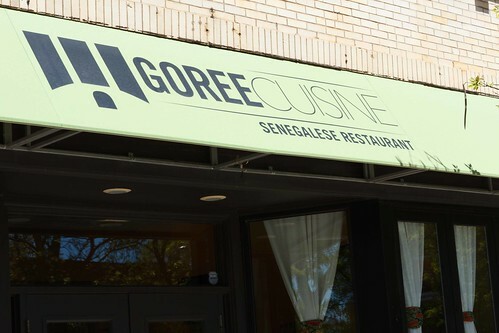 Spacious on the inside and full of light, Goree Cuisine brings authenticity to Chicago’s Kenwood neighbourhood that many mostly experience on Chicago’s North Side. 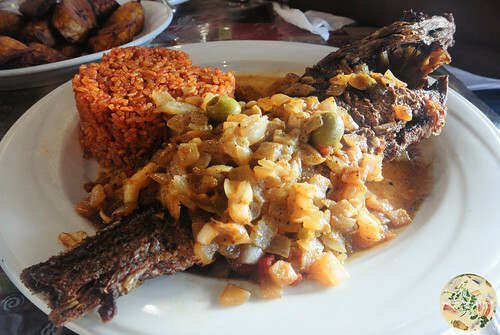 Having been to two other Senegalese restaurants in Chicago, one having lost a bit of its edge and the other one very much Dakar-in-Chicago, Goree Cuisine is an addition to the Chicago landscape that had won me over during my first visit and had me completely addicted on my second visit. The intent for my first visit was for a sampler, so I started with nem and fataya. Already aware of the history of how nem, the French word for spring roll, got its introduction into Senegalese cuisine via a Senegalese soldier’s marriage to a Vietnamese woman, I had an order mostly for comparison and contrast to others that I’ve had before. 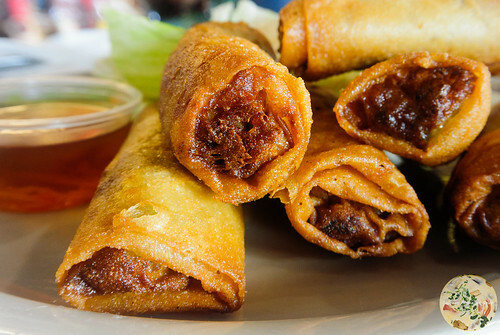 Stuffed with ground beef, shrimp, chicken, and glass noodles, I found these spring rolls to be considerably more appetizing than any of the proper Vietnamese variety and the best that I’ve had in America. The second street food appetizer I ordered was a plate of fataya. These flaky pastries with fish paste came with a side of kaani, a peppery tomato sauce, for dipping. Not stuffed to the point of the pastries looking puffed up, there was something almost cotton candy like with how they melted on the tongue. And considering they weren’t overly filled, there was still a lot of flavour in each bite. For the main dish, I had yassa shrimp at the chef’s recommendation. 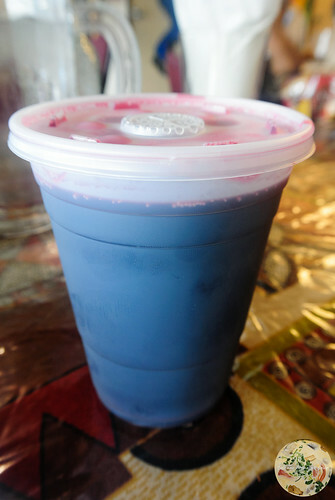 This was pure heaven and brought about all the wonderful memories of my university days and layovers in Dakar. 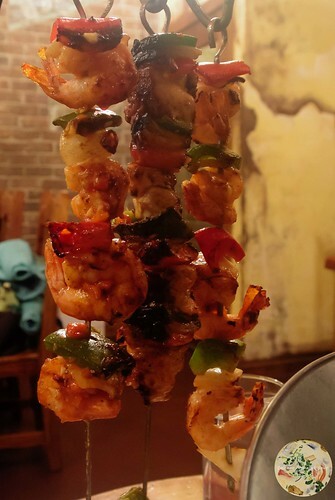 The shrimp were plump and fresh, complete with a hint of grilling in the taste. Served with grilled onions in mustard sauce, this was the first time on this side of the Atlantic Ocean I had a yassa dish without a visible squirt of Heinz mustard on top of the dish. The chef worked the mustard into the recipe and that made for the best yassa dish I’ve had since my last trip to Senegal. On the second visit, I had my restaurant advisor join me. I knew she would indulge whatever came from the kitchen without complaint and without nose turned up. We had nem again, of which she repeatedly said, “Wow!” We then had maffe and an accompanying bowl of aloco. The maffee came in a bowl of peanut and tomato sauce with carrots, potatoes, and yams, along with rice. Reminiscent of peanut soup we’ve had at Ghanaian and Nigerian restaurants, albeit thicker and heartier, we resorted to silence while finishing this dish. 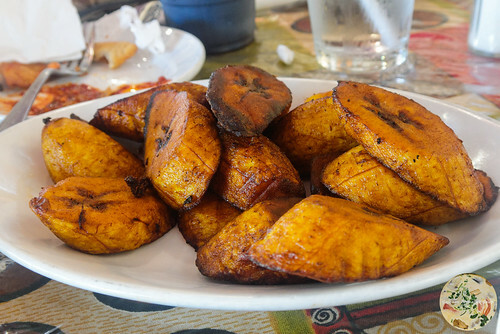 And the aloco were the best prepared plantains we’ve had in months. 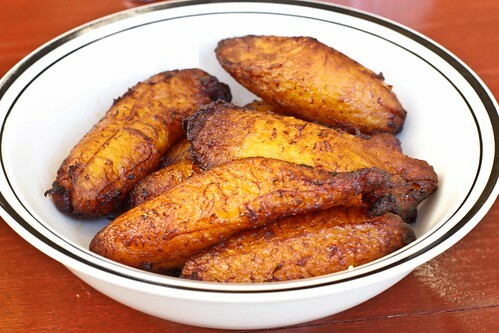 They must let the plantains get almost overripe before frying them just to the point of caramelizing them: the best. When my food advisor starts declaring, “It won’t stay on the fork,” I accept that fact that a dish is well past outstanding. This was the case with the yassa lamb. 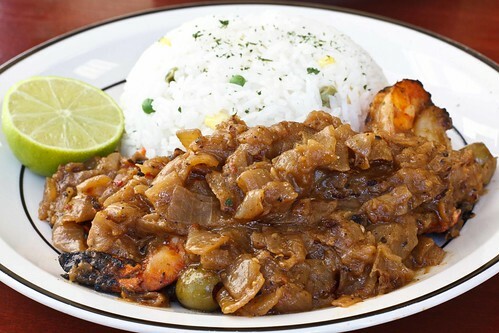 The yassa lamb came with grilled onions in a mustard sauce like with the yassa shrimp during my first visit and with yellow vegetable rice. The leg of lamb was a winner. Tender to the point where managing it was a bit trying because the meat kept falling off the bone without effort and not staying on the fork, the lamb also had no gamey aftertaste. 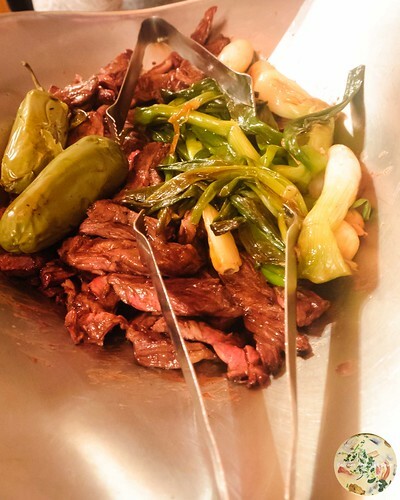 The chef hit the mark on sending a plate to the table with tender, juicy, succulent meat that left a great lasting impression. No food at Goree Cuisine goes into a microwave for a few seconds and then delivered to the table immediately thereafter. It is evident in the way the meat pulls apart from bones and how it falls from the fork. 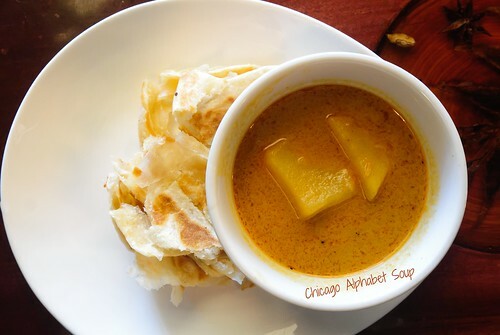 It is recognizable in how there are certain spices that you can taste “in” the dishes, as opposed to them tasting like the addition of condiments after the cooking. There is also no rush — no hurry up, be done with that plate, pay, and now leave. It is impossible to enjoy the cultural experience by rushing through it, so Goree Cuisine makes sure that not only will you fall in love with their loving from the kitchen, but that you will make plans to return repeatedly. I may not get back to Senegal often, but I will go to Goree Cuisine regularly. This has been a rather fast and adventurous year. 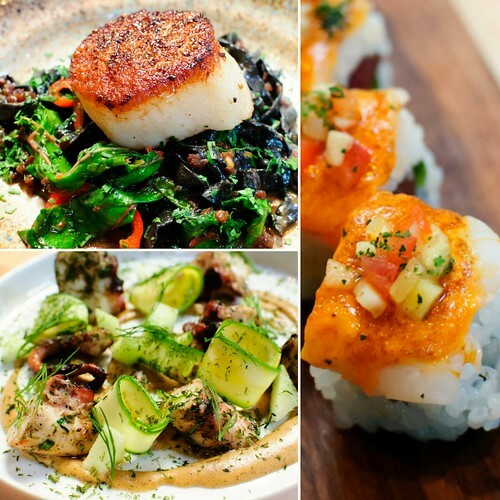 New restaurants, new cafes, new boutiques, and an appetite to go through all of them. So this brings me to the time for me to present my top 10 list of ethnic jaunts for 2016. There can never be too many Mexican restaurants in Chicago. If most of them were bad, it would be easier to say which is the best. Cantón Regio falls in the category of Mexican restaurants that make you inner fat child very, very happy. If you can make it through a meal without dancing in your seat, let me know. It can’t be possible to sit through a meal here and have no emotions, except for shedding tears for how delectable everything is. Peruvian food served the way it’s enjoyed in Peru. 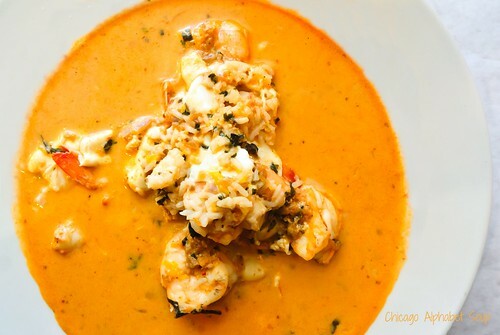 Peruvian food served the “Chicago way,” that being you’ll walk away stuffed. My recommendation for when the food is just “that” good and you start declaring, “Jesus,” clear it up by pronouncing the name the way it’s pronounced in Latin American countries so no one will know that you’re really taking Jesus’s name in vain. When you can get Malaysian food without it being buried on one of several booklet pages at a Pan-Asian restaurant, run to the restaurant, don’t walk. Serai is “real McCoy” Malaysian food. The Malaysians who are always there and my Malaysian friends can vouch for the way the food makes them miss home. 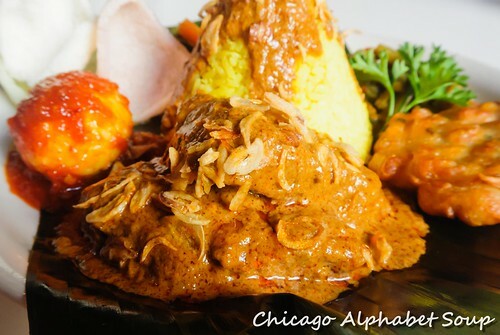 With there not being a short list of Indonesian restaurants in Chicago, Rickshaw Republic is all-authentic. It’s mandatory to make several trips because with all of the offerings, and all of them being amazing, you have to make more than one trip. You have to!!! When Osteria Langhe opened in Chicago, the city got the best Italian food this side of the Atlantic Ocean. 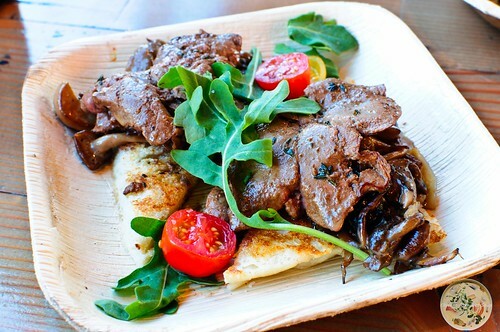 Animale is a more exotic version of Italian food, served in a fast casual setting. Logan Square is clearly vying for the position of international hub within Chicago, which is already a notable international destination. 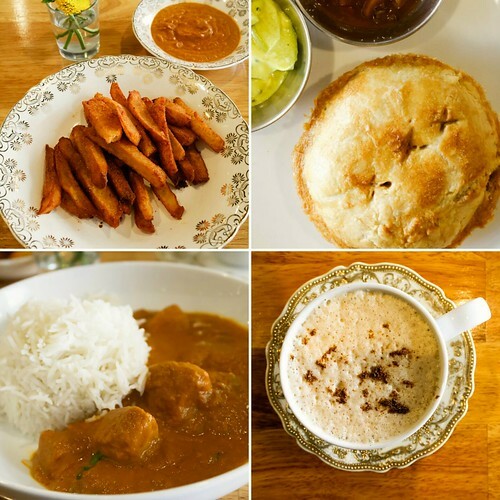 One of the more recent additions to the Logan Square landscape is Chiya Chai, a spot where you can get some chai to make you give up coffee and some Nepalese food with authenticity that transports you to Kathmandu. Knives? Forks? Spoons? 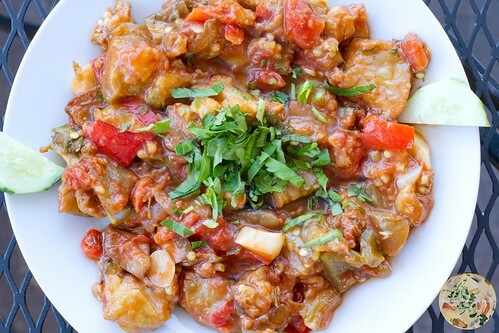 For the absolute best in cultural dining, Ethiopian dining is what you would want to indulge. 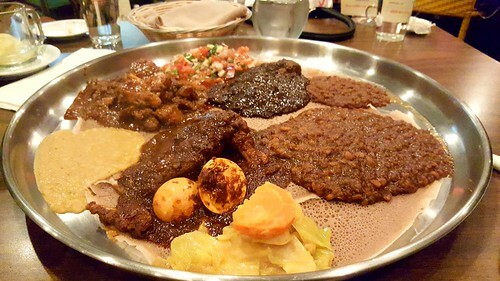 While Edgewater boasts several Ethiopian restaurants, Ras Dashen stands out as one of the few that deserves a seating. The slow renaissance in Rogers Park is bringing about the presence of several restaurants, many from an international eatpoint (new word). 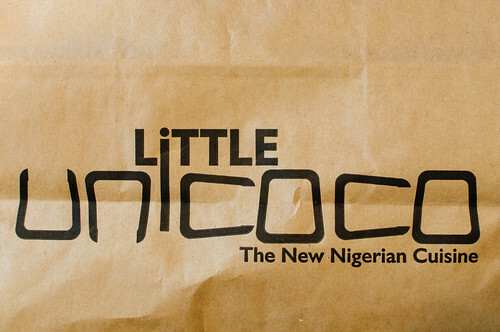 Little Unicoco brings Nigeria to Chicago’s Far North Side, complete with authenticity and an inviting atmosphere. Most people love sushi, maki rolls, and hibachi fare. But sometimes, it’s better to deviate from the usual and delve into the world of omakases. Small plates, attention to detail, flavours that pop, and the best Japanese food in Chicago without pretension. There you have it. While this may be the short list, there were several winners throughout the entire year. Once the temperatures warm up, check out a few of them. Oh, what the heck, go even when it’s frosty outside. Not only do you get to take advantage of someone else’s heat, but you also get to eat well. Enjoy. And we’ll see each other in 2017. In 2007 when my first adventurous restaurant friend and I were going through the alphabets, we skipped ahead to S for Senegalese at the recommendation of a mutual friend. 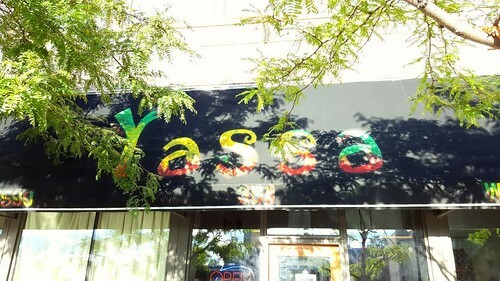 The restaurant, Yassa, had been featured on a show called Check, Please! There was a lot of buzz about it then and when we went, we found out why. The were simply outstanding! 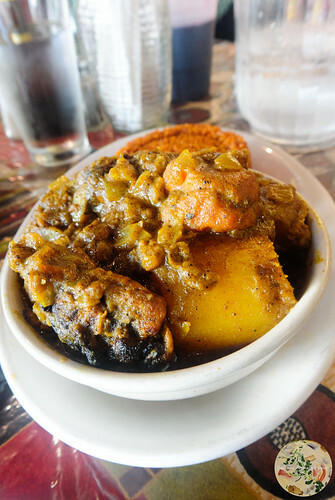 Fast forward to 2016 and Yassa has since moved from its location in the Grand Crossing neighbourhood to Bronzeville at 3511 S. King Drive. There is still the homey interior decor. The service doesn’t have the same welcoming feel as it did years ago, although the servers are accommodating after you’ve been seated and you’ve placed your order. During this recent visit, I went with my sister, who is an addict for any West African cuisine. 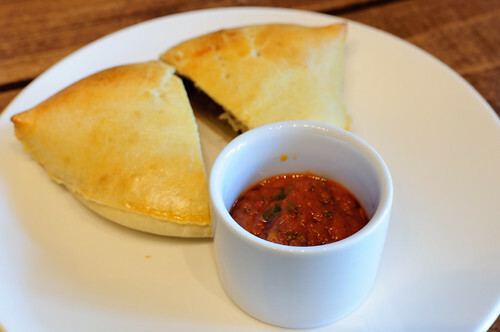 We started with fataya and nem, The fataya were meat pies stuffed with a tomato-based fish paste. For years ago, the stuffing made the pies hearty. There is still the mouth-watering taste, but the filling is less. The nem, which were smaller when I went in the past, were now larger and more filling. 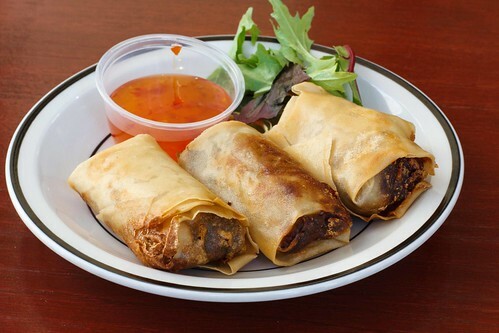 Having its base in Vietnam, many Vietnamese refugees had come to francophone West Africa during the Vietnam War and brought the egg roll recipe with them. Since then, it has been adopted in the West African diets, Senegal being one of the countries to add it to menus. Yassa brings them to America. 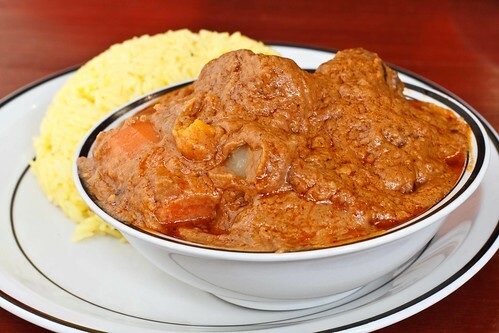 We ordered a dish of curry chicken with yams and djollof rice. The curry gravy was absolutely divine. The lack of meat on the chicken bones did take away from the dish. Being extremely comfortable using our fingers, my sister and I picked up the bones and sucked whatever meat there was off. With the sauce, we scooped it over the djollof rice and devoured that, after which we washed it down with a hibiscus favourite of bissap. The final dish we wanted to try was the red snapper. This came as a whole snapper with bone in. Again, we used our fingers to pick up the fish and devoured it along with a side of more djollof rice, cabbage with carrots, and plantains. The skin on the fish was crispier than its preparation in 2007. Good thing the inside was meaty. The plantains were good, but a few more days would have made them perfect. 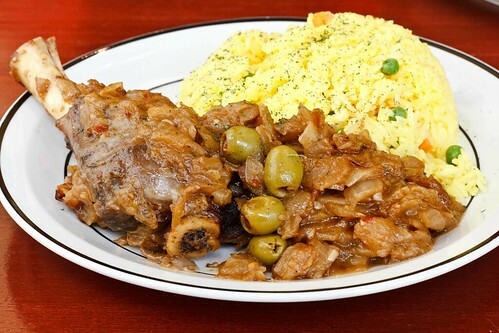 Those who like to go to restaurants that give large portions for menu items will love Yassa. The restaurant was quite lively and filled when we arrived. They were also preparing for a live band that was setting up for an evening set, so that may explain a bit of the scrambling with the table service as well as some “rushed feel” with the output from the kitchen. My sister and I admitted that we would probably have to return to try some other dishes that were familiar to us during our individual trips to Dakar. 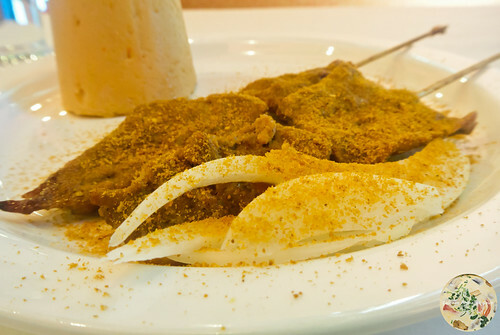 Once again, Chicago has two options for Senegalese restaurants. There is Badou Senegalese in Rogers Park, covering the North Side. 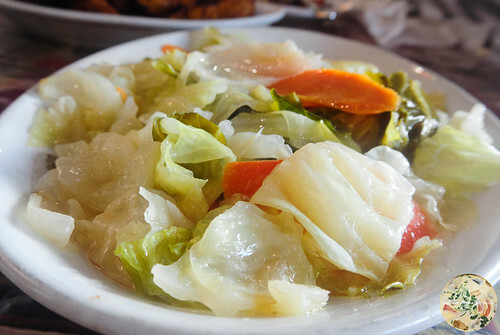 And there is Yassa in Bronzeville for those venturing through the South Side. A few weeks ago during lunch, I was reminiscing with a good friend about my days when I lived in Rogers Park. The neighbourhood has since changed. Old businesses have closed. New businesses have opened. The changing demographics of the old neighbourhood are bringing a new vibe. And with all of these changes is a wave of restaurants with international flare. My friend had mentioned that a new Nigerian restaurant opened next to my favourite coffeehouse. So, this week I was off to Little Unicoco at 1631 W. Howard Street. Arriving during the mid afternoon, I had a seat in what is called the market area of the restaurant. The larger lounge area was on the other side of the walled partition. After placing my order, I had fried, sweet plantain chips. Forget about potato chips and fancy chips touting less fat and healthy options. 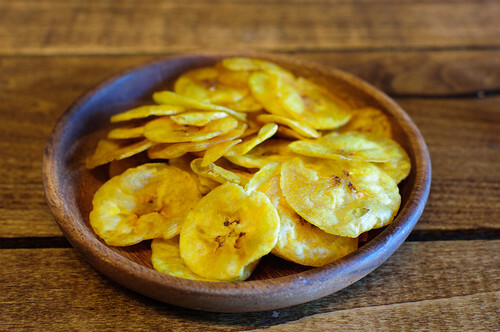 The all-natural sweetness and pop in the fried plantains were a winning combination. I was glad to find that the market portion of the restaurant has these lovelies bagged for take-away. Much like the most recent Doctor Who, I’m not always a good man. Having inquired about whether there was ginger beer for imbibing, the server informed me that there was. She even poured the beverage with care, as if pouring beer. But this was the good kind of beer. Nothing like the fizzy pop that you buy off the shelves at your local grocer, this reminded me of homemade ginger beer, the variety that people take time to boil with real ginger that they leave in and you get to enjoy somewhat as candy when you’re done downing the ginger beer. 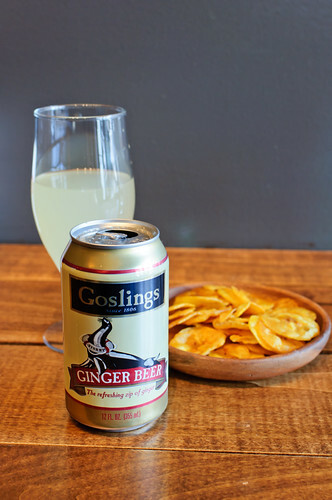 Being bad, I sent a photo to my food advisor, knowing how much she loves “real” ginger beer. I imagined her shaking her fist at her cellphone before she sent a text back to me with three words: Don’t tease me! 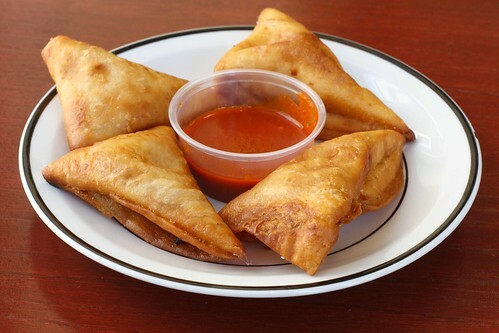 One of my favourite Nigerian snack foods is a meat pie. 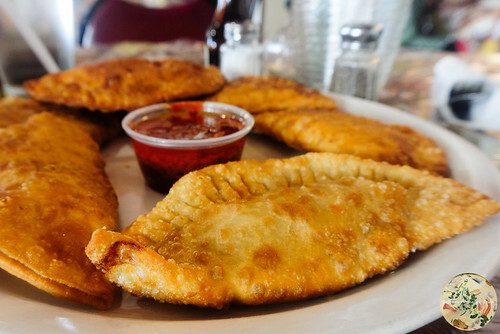 Bread is a vice and the crust in Nigerian meat pies is well past addictive. Filled with a nice amount of minced, ground beef, this is a food addict’s dream along with a tomato based hot sauce. 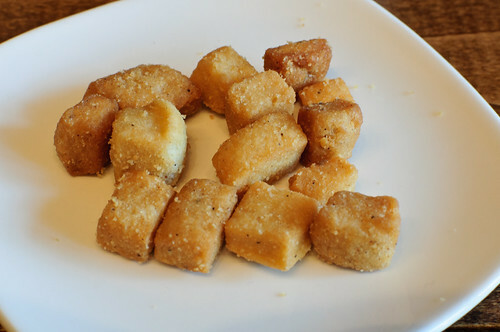 By the third bite, I had decided that I would order several for take-away so that I could have them for breakfast over the next few days. The caveat is I will devour them all in one day. Next to the table was suya. 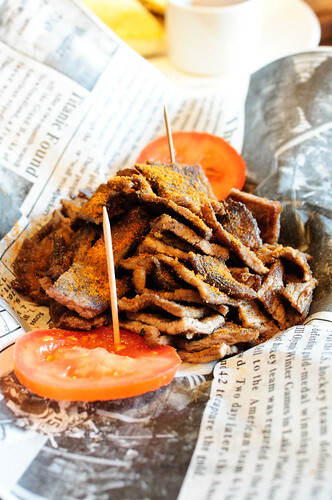 This is another snack food that screams “have at it and know that I am the best barbecue ever.” Sliced beef with Yaji spices on onions and tomatoes, the ginger from the ginger beer combined with the spices on the suya transported me mentally back to Lagos with my university classmates who knew where to find all the good street food. The final dish was one that I have loved with rice. But on this visit, I had to lose my Westernisms and devour this dish with pounded yam rather than with the assistance of table utensils. Egusi soup. This bowl of spicy, pounded egusi seeds filled with fish and beef is my favourite Nigerian dish, with non-vegetarian pepper soup and isi ewu coming in next. 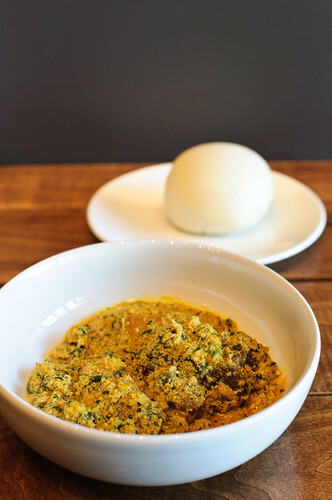 I have enjoyed the spicy kick of egusi soup with rice whenever I had a chance to have a bowl placed in front of me, however, there was something about eating it with the pounded yam that made it taste like I was eating something from home. As a wrap-up, the server asked if I would like to sample a dessert. 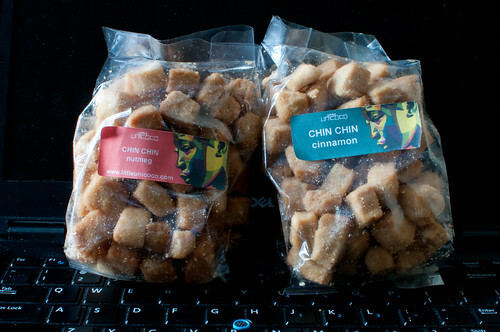 You have not had a tastier snack until you have had a fried pastry called chin chin. I sampled some that had been flavoured with nutmeg. I remembered being gifted some from a classmate’s mother who prepared some for a care pack when I was leaving Nigeria to return to New York for an intern when I was in university. It was as if I had gone back to Ibadan in 1989 to relive that flight again. Little Unicoco packs a huge punch with authenticity. Granted I went earlier in the day well before the dinner crowd arrived, the service was still top. The atmosphere was welcoming and even the owner walked to every table and inquired as to whether this was everyone’s first time having Nigerian food and if there were any answers he could provide. Now I have another go-to Nigerian restaurant in Chicago. Big ups, Little Unicoco.